This article review the drop height and ride height of the Space Mountain roller coaster at Walt Disney World. Does Space Mountain have drops? Yes, Space Mountain has multiple drops. The drops that Space Mountain has are small to medium in size when comparied to other roller coasters and rides, including Splash Mountain. The Space Mountain drop height varies at different portions of the ride. According to some sources the drop height for Space Mountain Disney World is 26 Feet or 7.92 meters. This is the maximum drop height. The drop is located near the end of the ride. Space Mountain does not have big drops like other, more intense roller coasters. Most of the roller coasters in Walt Disney World and the Magic Kingdom are not as intense or scary when compared to other theme and amusement parks. The Space Mountain big drop is the 26 foot drop that is experienced near the end of the ride. There are no loops or upside down inversions on the Space Mountain Magic Kingdom roller coaster. In fact, there is no ride or attraction in the Magic Kingdom that goes upside down. Are there any big drops on Space Mountain? Answer: The 26 foot drop is the largest drop that Space Mountain has, which in comparison to other rides is not that big or tall. Splash Mountain, in Frontierland, has a much bigger drop than Space Mountain. The Space Mountain height is 60 feet or 18.29 meters. This is the Space Mountain ride height at the highest point of the ride. Some places are reporting that the height of the ride is 183 feet or 55.78 meters. This may be incorrect, as this is the height of the exterior of the building that houses the attraction. 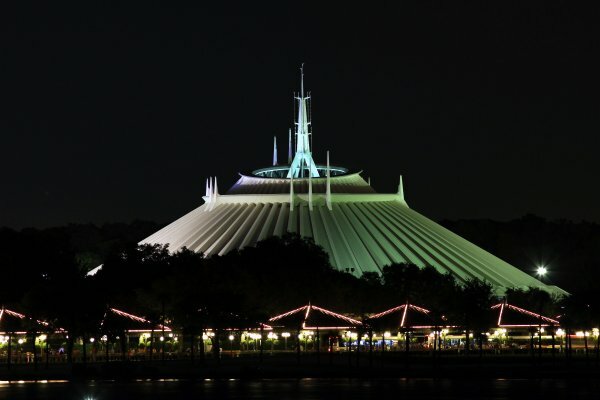 The exterior height of the Space Mountain building is 183 feet, which is measured all the way to the peak or tower that is on top of the building. If you are looking for height restrictions for the ride, you can find the information on our height restrictions page. More information on Space Mountain in Tomorrowland at the Magic Kingdom can be found by visiting the other pages here on the site.